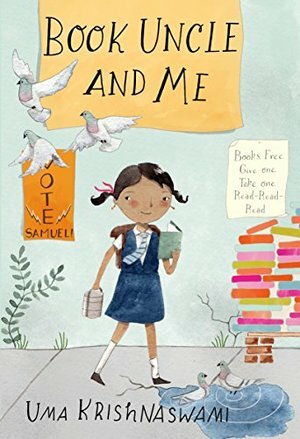 Every day, nine-year-old Yasmin borrows a book from Book Uncle, a retired teacher who has set up a free lending library next to her apartment building. But when the mayor tries to shut down the rickety bookstand, Yasmin has to take her nose out of her book and do something.But what can she do? The local elections are coming up but she’s just a kid. She can’t even vote!Still, Yasmin has friends her best friend, Reeni, and Anil, who even has a black belt in karate. And she has grownup family and neighbors who, no matter how preoccupied they are, care about what goes on in their community.Then Yasmin remembers a story that Book Uncle selected for her. It’s an old folktale about a flock of doves trapped in a hunter’s net. The birds realize that if they all flap their wings at the same time, they can lift the net and fly to safety, where they seek the help of a friendly mole who chews a hole in the net and sets them free.And so the children get to work, launching a campaign to make sure the voices of the community are heard.An energetic, funny and quirky story that explores the themes of community activism, friendship, and the love of books.